It's never too early to get kids interested in tennis, and at Tennis Court Supply we have supplies perfect for the 8-and-under crowd. 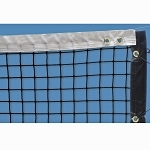 We carry both nets and posts, sized correctly for youngsters and made to the same high standards as professional adult tennis equipment, by manufacturers like Collins, Douglas, and Putterman. We also have Douglas portable tennis net systems so you can set up an 8-and-under tennis court temporarily, or in a location where you cannot insert posts into the ground. If you have any questions, please contact Tennis Court Supply and don't forget to browse our catalog to find the rest of the 8-and-under tennis supplies you need.